This month I hope to make several “new to me” salads so I started with a Piña Colada Coleslaw that seems to be everywhere on the internet it is a very light and gently flavored with tropical flavor ingredients including pineapple and coconut milk. Sorry no pictures, but I do have a picture of the Sunday herby peanut noodle salad from Hugh Fearnley-Whittingstill’s cook book River Cottage Veg and I had enough leftover for lunch. I think that a darker regular soy certainly is more flavorful or should I say heavier than the thin soy that I buy from the Asian store, but I prefer the thin soy that does not over power the delicate noodles and tender vegetables in the salad. For the dressing, whisk together all the ingredients in a large bowl. Cook the noodles according to the instructions on the package. Drain and rinse under cold water. Add to the dressing and toss until well coated. Leave to cool completely in the dressing. Cook the beans and snow peas in a saucepan of lightly salted boiling water until just tender and still a bit crunchy, 3 to 5 minutes for beans, 2 to 3 minutes for snow peas. Drain, plunge into cold water, and drain well. Halve the cucumber lengthwise and slice thinly. Finely slice the green onions on the diagonal. 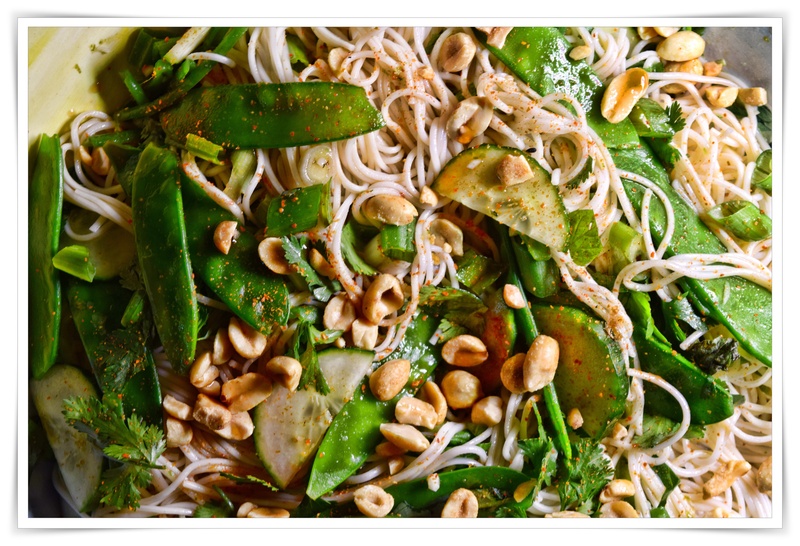 Toss the cooled noodles with the peanuts, cucumber, green onions, beans, and/ or snow peas and herbs. Fearnley-Whittingstall, Hugh (2013-05-14). River Cottage Veg: 200 Inspired Vegetable Recipes (Kindle Locations 968-979). Potter/TenSpeed/Harmony. Kindle Edition.